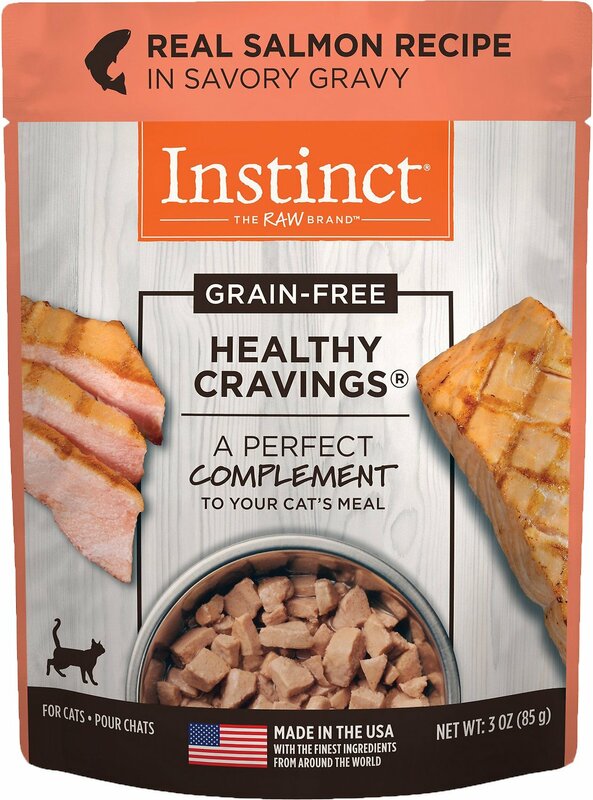 Satisfy your pet’s need for real food with Instinct by Nature's Variety Healthy Cravings Grain-Free Real Salmon Recipe Wet Cat Food Topper. Guided by the belief in nutrition that is real, whole, pure and as close to its natural state as possible, this topper makes the perfect complement to your cat’s meal—adding the taste and variety that he craves, with the nutrition of raw. It’s also great for adding the moisture that his diet needs, in the delectable form of wild-caught salmon in a savory gravy. Cuts of wild-caught salmon in a savory gravy make the perfect meal complement. Use it as a topper or mixer to add the delicious taste and moisture your cat craves. Never contains any grains, potato, corn, wheat, soy, by-product meal or artificial colors or preservatives. 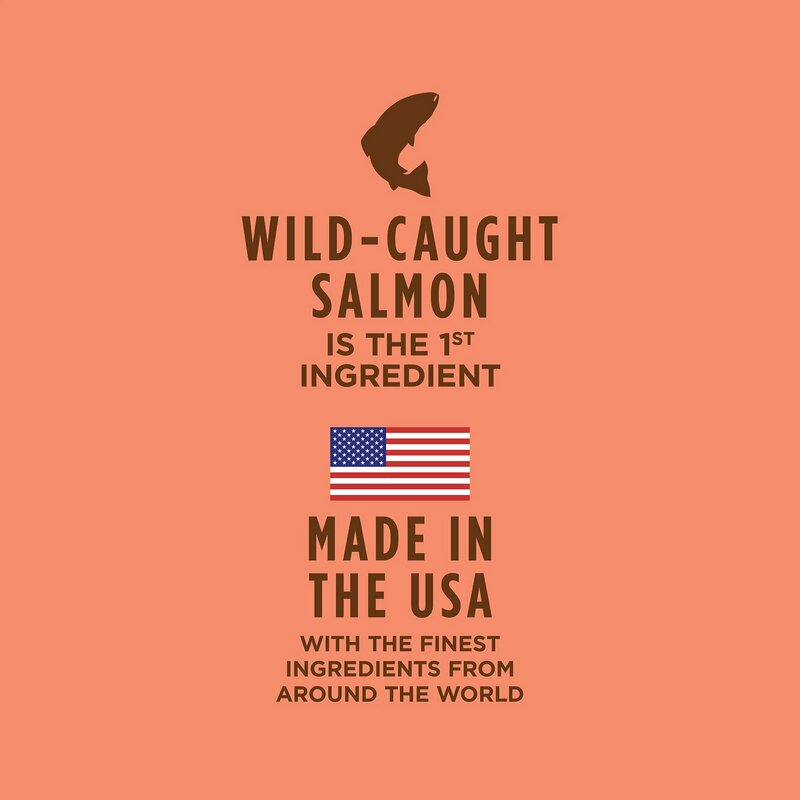 Made in the USA with the finest ingredients from around the world. Guided by the belief in nutrition that is real, whole, pure and as close to its natural state as possible. Instinct Healthy Cravings Salmon Recipe is intended for intermittent or supplemental feeding only. This is a complementary food and should be fed along with a complete and balanced diet. Gracie is 14 and has health issues. I have struggled to get her to eat enough. She loves this topper and is eating well again. I can't get my kitty to eat any kind of chicken, unless I get this mixed into it. Then she gobbles it all up. Evidently, the taste is irresistible! I will continue to keep buying this product! I bought a pack of this flavor by mistake at a local pet store. I have never known my cats to really prefer ANY food with salmon and was going to return it, until one evening I decided to tear it open for a hungry little mouth. To my shock all Three then showed interest and much delight in it! I therefore bought a case from Chewy. I will use it as a topper, or simply give them a pack to eat as a meal every now and then. We don't eat much fish, but the wild salmon is supposed to be best for them. Happy variety for the kitties! I bought this because my cat refuses to eat kibbles. I topped her dry food with this and she loves it! We have a highly selective senior cat who never eats fish based foods and a younger cat who adores fish. Surprisingly both cats loved, loved this food and we approved of the ingredients. I purchased it as a food topper over their raw food. The meat has a light sauce covering medium size chunks. I wished it had more sauce and smaller chunks. I use a fork to mash up the chunks for our senior cat. I plan to purchase more to use as an occasional food treat. My cats liked all of these new Instinct packets. I tried every flavor and they ate it up. The meat is a chewy meat though and not easy to mash. Some of my kitties prefer a pate and not chunks, so I try to mash the food.